"Moist mouth watering bars topped with rich peanut butter frosting .These yummy treats disappear in my home. If you like, reserve a few of the chocolate chips to sprinkle on top for decoration." Preheat oven to 350 degrees F (175 degrees C). Grease a 9x13 inch baking dish. Sift together the flour, baking powder and salt; set aside. In a large bowl, cream together 3/4 cup of butter, brown sugar and white sugar until light and fluffy. Beat in the eggs and yolk one at a time, then stir in the vanilla and 6 tablespoons peanut butter. Blend in the sifted ingredients and stir in the chocolate chips. Press the mixture evenly into the prepared pan. Bake in the preheated oven for 25 to 30 minutes, or until a toothpick inserted into the center comes out with moist crumbs. Cool completely before frosting. To make the frosting, mix the remaining 1/2 cup of butter and 1 cup peanut butter together in a medium bowl. Mix in the confectioners sugar until smooth, then gradually stir in milk until a spreadable consistency is reached. Cut, serve and enjoy! 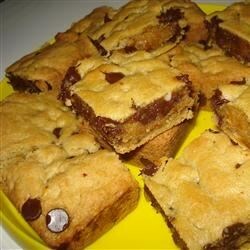 These blondies came out tasteless and dry....one word... grosssssssssss! Icing was out of this world though. There are excellent. I did not make the frosting though, I thought it would be too sweet for my taste. The bars themselves are very good and have a nice texture. I will make these again. my mom used to make these when i was little, and this recipe certainly does those memories justice! i use white chocolate chips instead of semi-sweet, and everyone loves them. thanks! EXCELLENT!! the frosting made way too much though, next time i'm going to cut it in half and that will still be plenty! Iincredible! Who ever says its too dry or dense...didnt do it right! I used a hand mixer to blend everything! Awesome...kind of like a big chocolate chip/peanutbutter cookie! A very good recipe if you're a peanut butter cup fan. Add a little more white sugar and peanut butter if you don't plan on frosting them. Have plenty of cold milk on hand!